The Mets beat the Phillies for the second straight night, locking the two teams in a tie for third place in the NL East and seventh in the Wild Card. At the moment, Lucas Duda is nursing a hamstring strain, and may or may not be headed to the DL. Can a hamstring injury prevent a player from recognizing sliders in the dirt? Joking, of course. But after nearly 800 plate appearances, we have only a vague idea of Duda’s true potential. 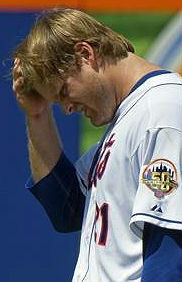 Based on the information we have on him, what should the Mets do with Lucas Duda? After a tough stretch against the Nationals and Yankees that saw the Mets drop 5 of 6, it’s time to ask the question at the back of every Mets fans mind. Are the Mets contenders this year? Will the Mets play meaningful September baseball for the first time since 2008? Luckily, thanks to sabermetrics, we can analyze some advanced statistics and trends from the season so far to try and get a handle on the 2012 Amazins. For more information on any of the stats listed below, simply click on the stat name. The staff stopper fulfills his role and salvages the final game of the series. The final score belies what this game was.